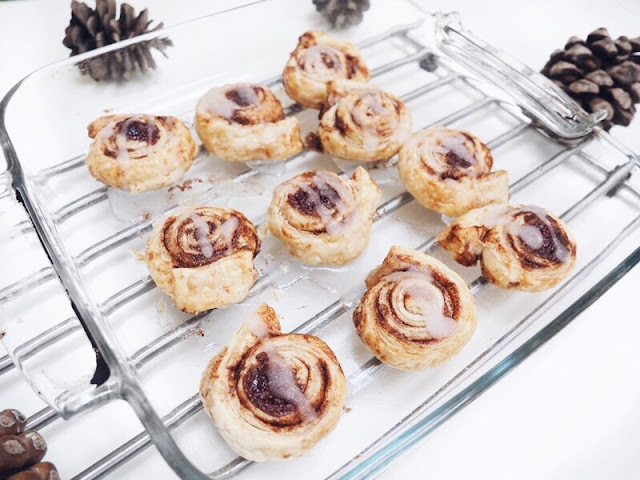 In the autumn there is nothing like a warm gooey cinnamon tasting pastry, imagine cosying down with a blanket, hot chocolate and a couple of these dribbled with icing sugar. Well when I saw Carrie post her recipe on the blog I was thrilled, not only could I get the taste of cinnamon but also the fresh warmth that shop bought just can't give you and with very little effort! So what better way to spend a Sunday! All you need, is the first incredible cheat, pre rolled puff pastry. combine 1/3 cup of butter, 1/3 cup of caster sugar and 2 tbsp of cinnamon ground and mix to form a paste, then spread it evenly over your puff pastry and roll that back up. Pop it into the fridge wrapped in cling film and heat your oven to 180oc. 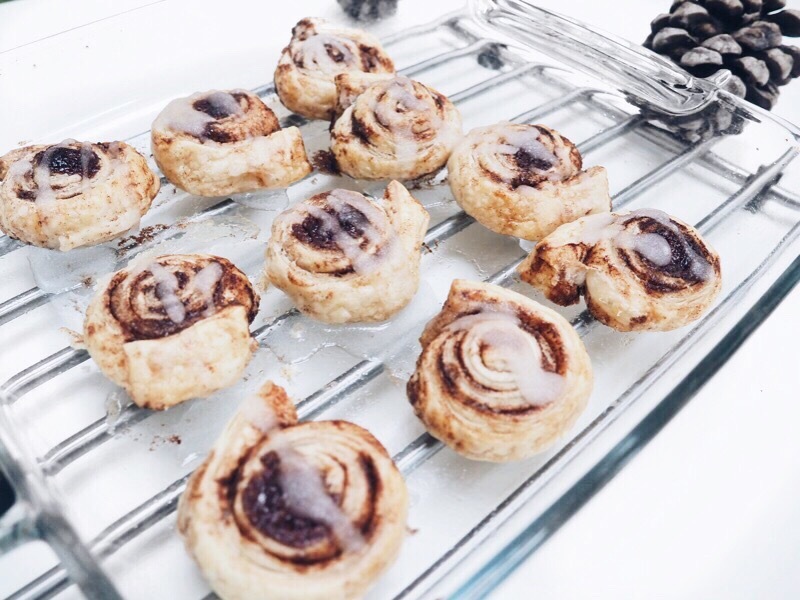 Once the oven is heated bring out your cinnamon swirls, cut them into slices, these were cut in 1inch sections and so came out on a bit of the small side and then pop them in the over for 25-30 mins always check them though as once they go that lovely golden brown colour they're ready to bring out! Don't forget to make that sweet icing to drizzle on top! All you need is icing sugar and water and combine them till you get a consistence you're happy with then drizzle in a zig-zag motion using a tea spoon or any appliance you wish! Then volia! 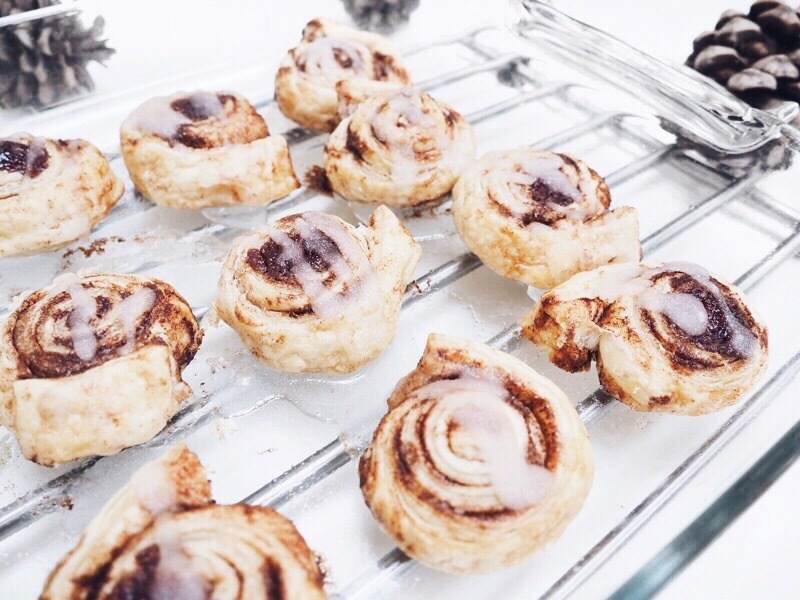 toasty gooey swirls to snuggle down with while watching some I'm a celebrity get me out of here on these cold evenings. Have you got any easy to make recipes you love to make on a sunday? These look yummy, must try and make some.